Jon and I are busy these days on all kinds of other web projects. Find me here, and Jon here. I love sport. I’m not very good any any particular kind, but I’ll play almost anything. I have heaps of sports equipment I’ve used only a few times, and drawers of uncompleted sports-club application forms. I’m always keen to play, but the hardest part is finding someone to play against, or finding a team to play with that isn’t made up of semi-pro hotshots who played in their high-school first team. 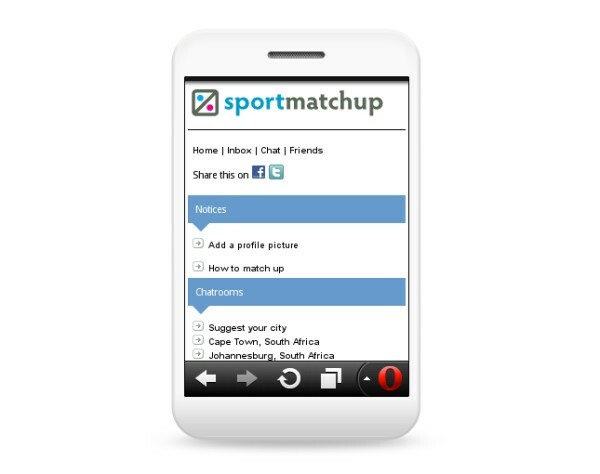 So, SportMatchup is a community site for finding competitors. The site is first and entirely a mobile site: not only is mobile likely to be the primary user environment in the near future, but I really wanted to try out a free-site-building service called Motribe. Motribe’s super easy to use. Including designing a logo, it took me twenty minutes to set up a basic mobile site, including adding advertising from AdMob and InMobi – I enter my AdMob and InMobi IDs on the Motribe dashboard, and revenue from clicks will gather in my ad-publisher accounts. (UPDATE: Misunderstanding: Ad revenue is possible from upgraded, paid Motribe products; for free sites, ad revenue goes to Motribe, presumably to help sustain the free service). By default, the Motribe site gets a motribe.mobi domain, but I could point my own domain there instead, if I thought it worthwhile. For now, Motribe’s free service let’s me test the concept without even a domain-name-fee commitment. Tools used: Motribe.com, logo done in Illustrator and optimised in Photoshop. Process: Open a Motribe account, and enter some basic site details; design logo, upload to Motribe dashboard; drag-and-drop Motribe ‘plugins’ (site elements) and create city-specific chat rooms; write SportMatchup user guidelines; open ad-publisher accounts with AdMob and InMobi, and enter site IDs in Motribe dashboard. Make site live in Motribe dashboard. The Rontgen Award site has been live for three days and has had 129 visits. That’s not going to impress Mark Zuckerberg, but I’m ecstatic: it’s already about ten times what most other sites in this project get every month, without any more effort on my part than usual. It’s hard to know why or whether it will continue, but I can hazard a guess: my wife Michelle and Lauren Beukes. These two dynamos know more people than Santa Claus, and their sharing and tweeting the site is a lucky break. (They’re what Malcom Gladwell calls connectors in The Tipping Point.) But it’s not all luck: my network of friends are mostly literary folk, and here’s a site I’ve made that fits with that network’s interests. As I try to bank little entrepreneurial lessons from the 52sites project, I reckon one might be this: as you get going, your friends are going to be the most important promotional tool you have. Love them well. 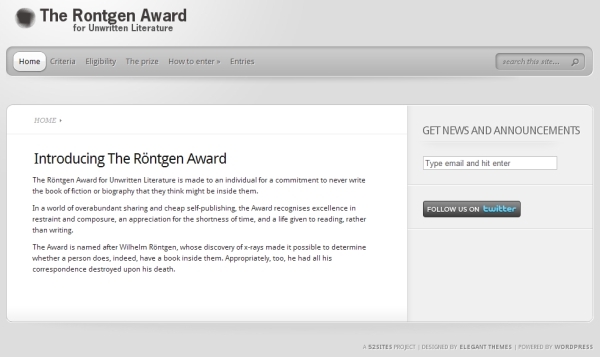 Update 16 Dec 2013: The Rontgen Award site is now archived here. I’ve wanted to build this site for years. Well, the site’s just a vehicle: I’ve wanted to organise this award for years. I used to be a book publisher, and it was there that I developed this particular belief: the decision not to write a book can be as valuable and important as the decision to write it. Seriously, writing a book that shouldn’t be written is a monumental waste of human resources. And every day, such books get written, and have to be mailed, and have to be opened, and even read, and turned down, and then mailed elsewhere, and so on. It’s awful. And all those good people who put that energy into something else go unnoticed. No more! Now there’s an award for not writing that book. The tone is tongue-in-cheek, and some of the intent. But at its core, this really is an important award. People who don’t overshare are lovely, valuable souls who deserve our praise. Like Wilhelm Rontgen himself, after whom the award is named. You can read more on the site about why the award’s named after him. 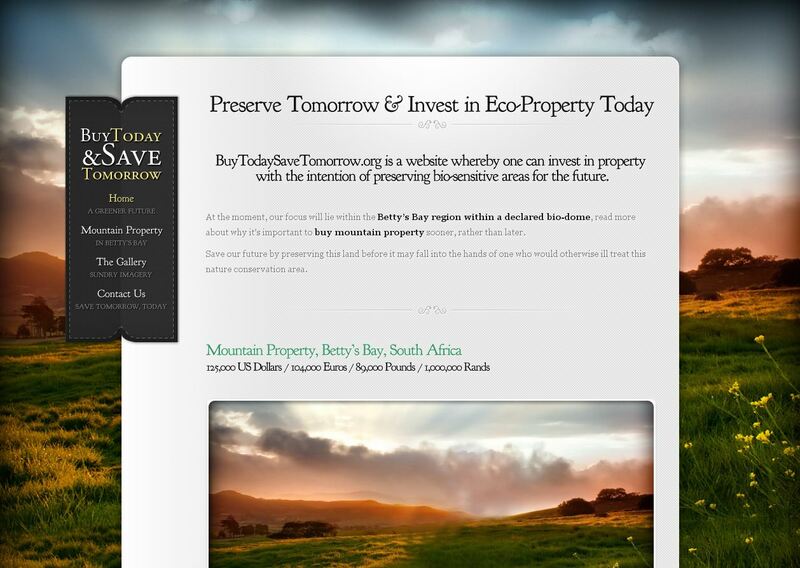 Tools used: WordPress CMS with the Professional theme by Elegant Themes. I’ve used Formidable Forms for the entry form, and a simple PayPal button for entry fee payments. I did the logo with The GIMP. Process: I built the site on my own machine first, wrote all the text, bugged Michelle to read and comment on it (really just to say how wonderful it was, which she dutifully did), then transferred the files onto my webhost’s servers after registering the domain. I spent a lot of wasted time trying to find the most efficient, water-tight way to take people’s money for the entry fee. Using the limited time, plugins and code abilities at my disposal, I could either make things easy for me or easy for users. I chose easy for users – I’ll have to sit and reconcile payments with entries by hand, and copy and paste text from entries that come in by email, rather than going straight into a database. If I get loads of entries, I may have to spend money on commercial WordPress plugins that will beef up the backend and save me admin time. Ah, I also set up a Twitter account for the award. I’m going to need that to keep the promotional social conversation going. We’re behind. Dammit. The reasons are nothing special: life is a busy place, and when the going gets tough, crazy overcommitments to constant product development take a back seat. The aim of the 52sites project is to learn and share. So here’s an early lesson: the more you build, the less you sell. We’ve churned out websites, but haven’t made any time for promoting them. We knew this would be a problem, but I certainly underestimated the scale of it. My early sites are getting about 20 visits a month on average, with the exception of How to Publish Poetry, which is getting about 120. We’ve spent about twenty times more than we’ve made, and that doesn’t look like it’s changing. So we need to change things up a bit. While persistence is valuable in business, persistence in the face of an obvious need to change is crazy. So we’re pivoting. We have a pretty good idea of how, though we’re still working out the kinks. We’ll still be making a lot of sites (it’s fun, and we’re learning), but we’ll spend a lot more energy on promotion too. Some years ago, my company published Child Health Care, a textbook for nurses in South Africa. The content is open-licensed (Creative Commons). While EBW has a site for all its content (EBWHealthcare), I thought it would be an interesting experiment to create a super-simple one for basic mobile phones containing only the content of one book. The primary focus is simplicity. Of course, Google doesn’t like duplicate content, so this site won’t get great rankings in search results, if it appears at all. 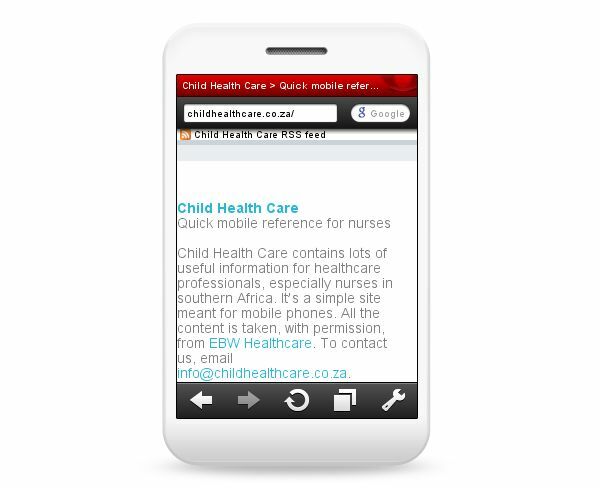 Canonical links on EBW Healthcare’s site will help keep it ranking as the primary source for this content. Tools used: WordPress CMS with the simplr theme by Scott Wallick. (I had the adjust the theme quite a bit.) Filezilla for installing it and phpMyAdmin for getting the content into the database. That’s about it. Process: First, I checked with the EBW Healthcare team that it would be okay to do this site. I got the content directly from EBW Healthcare as SQL. Once I’d imported the SQL content using phpMyAdmin, I spent several hours moving it around and cleaning it up the way I needed it in WordPress. Then I worked through the template files making changes (mostly commenting out code I didn’t want and changing CSS). Finally, I added the affiliate links for purchases. Probably about ten hours in total in the end. So Michelle’s company is organising a conference, and she wants them to make Twitter a part of it somehow, since so much interesting comment about the goings-on at a conference happens there. We were discussing how best to do this. The best, simplest thing I’ve seen is a big screen where tweets related to the conference are displayed publicly. It keeps passersby in the loop. Tweets from people inside sessions can steer those outside to the best ones (“Julie’s talk on microwave popcorn is awesome! Tough questions coming though”). And when tweeters see their tweets really are public, they may be more constructive tweeters. So TweetingMeeting is a site that makes it really, really easy to put up a big screen of fresh tweets about your conference. Open the site on a public screen, type in a keyword (e.g. a hashtag or the name of the conference), and hit enter. It’s designed to be readable, clean, modern, elegant (the usual stuff, that is), so it should fit into almost any conference decor, where that matters. This is a tough one to monetise. I’ve got a link to some Google ads, which will probably relate to conference organising in your area. (Ideally, they should reflect the content of the current tweet stream, but I don’t think Google uses that to identify suitable ads.) We’ll see how it goes. Process: Many hours getting the basic Twitter search and page refresh working; then more hours working on the design (CSS and HTML). Only once I was sure it worked and looked okay did I register the domain, and upload the files to my web host. Total time, probably about 12–15 hours spread over three days. Update 16 Dec 2013: The LunchMoney site is now archived here. I’m sure there are many people like me: we like to be helpful. So people ask us questions, and we’re helpful, and they ask more questions, and we keep getting our kicks from helping them, and then we die. Of starvation. LunchMoney gives people (usually small businesses) buttons for their emails (or websites, but usually emails) that let their recipients make a quick, small, defined donation in return for helpfulness. Getting paid this way would be great, if it happens. Of course, I estimate that one in a thousand emails will actually elicit a payment. (I’ve been putting LunchMoney buttons on selected emails for a few weeks to test the system before going live. No tips yet…) But that’s the thing: the payment is not the point. For most people, the point is the point: the point that there’s no such thing as a free lunch, and that now and then, there’s nothing wrong with a monetary thank-you. If LunchMoney gets sign-ups, it’ll keep 10% of all payments. This should cover PayPal charges and leave a percent or two as revenue. Tools used: WordPress CMS with the Modest theme by Elegant Themes. I used Photoshop to create the logo. Process: Register domain; install WordPress; download, install and set up the theme; set up PayPal donate buttons; design buttons in Photoshop; write copy; set up Facebook page required for theme. Probably about five hours’ work spread over several days. 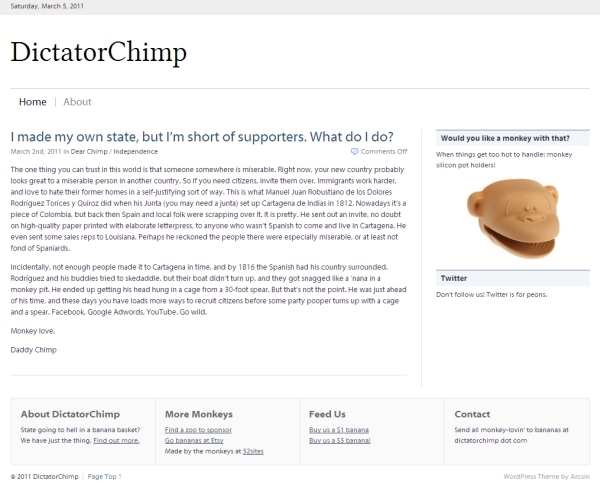 Update 16 Dec 2013: The DictatorChimp site is now archived here. My cousin Tom and I used to stay up very late to solve the world’s great problems. Political philosophy, literature, computer gaming, all the important stuff. But at some point, usually around three or four, we’d start talking rubbish. When we noticed it, we’d call it: “Bananas, bananas, bananas.” The phrase summed up the opaque silliness that our thinking had become. Bed time. But there it is: DictatorChimp.com. I won’t try to explain. It must stand for itself. I’ve written and scheduled a few posts for it, and so help me Great Monkey, I’ll add others to keep the site alive long enough to prove itself. Tools used: WordPress CMS with the free Simple Magazine theme by Arcsin. Monkey products it the side bar are Amazon affiliate links, and the donations links at the bottom are PayPal donation buttons. Process: Register domain; install WordPress; download, install and set up the theme; set up an affiliate account on Amazon (done for previous site); write copy. Probably about five hours’ work spread over several days. But this doesn’t include at least ten or fifteen hours spent trying various themes, designs, and concepts before hitting on a simple one that kinda works.